You won’t be able to look this cool without knowing how the combat works in Final Fantasy XV. Final Fantasy XV continues the long legacy of epic battles with dangerous beasts, ravenous monsters, and belligerent foes. In order to take them on, the skillful player must know his tools for war. 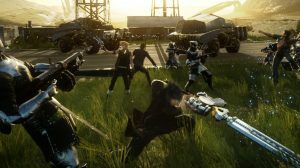 In this page we will look at the combat basics in Final Fantasy XV so that the player can familiarize himself with all the complexities of the game’s battle system. Walking around the majestic world of Eos, you might see a red threat meter appear at the top of your screen. This means that you are going to be spotted by the enemy, pulling you into battle. You should note that monsters have varied reactions. Some might take notice of you very quickly, while others might not take notice of you. Use this to your advantage. One way of using this to your advantage is to use warp-kill on your human enemies. If you’re very near a human foe, you will be shown a button prompt (either triangle or Y), that teleports you and instantly kills your target. You may repeat this until you are caught. However, there may be times when you can’t stealthily defeat your opponents. Instead of warp-killing them, you could opt to use warp-strike instead. This command teleports you next to your target as you inflict devastating blows against your opponent. Be warned, though, this might cut you off from your team mates, leaving you alone and with the undivided attention of your enemies. You’re now locked in one of Final Fantasy XV’s intense battles. In this game, you are given a lot more liberty and a lot more movement. Therefore, you could use this to your advantage. Many attacks are now avoidable with the right combination of contextual button presses and you’ll find your enemies missing as well as a vantage point for you. The first thing you need to make sure of is the number of things you are about to face. Take a good look at your surrounding area, and how much enemies you need to face. For this purpose, use the right analog stick. A menacing rubyshears is charging at you, its claws poised to strike! The first thing you can do is to roll-dodge. You can do this by tapping the square button (PS4) or x button (XboxOne). Rolling away from the opponent not only delivers you to (relative) safety, it may offer you a better vantage point to engage the enemy by doing so. The next thing you could also do as an enemy comes at you is to defend or phase. By holding down square (PS4) or x (Xbox One), Noctis automatically avoids getting hit by the enemy. This drains MP, though, so be careful! It sometimes does not work when your enemies hit with harder blows. Another move that costs MP but is useful in battle is warp. Press triangle (PS4) or Y (Xbox One) to speedily evade attacks. Noctis teleports forward while remaining immune to enemy attacks. A bloodhorn is enraged, barreling at you at a high speed. What do you do? Sometimes, a button prompt appears on the screen, which allows you to parry with either the circle button(PS4) or B (Xbox One). The attack is deflected if you manage to press the button on time. However, pressing the button at the wrong time will not save you from an attack. Now that you’ve parried the attack of your foe, leaving him open to a counterattack, it’s time for you to strike. Press circle (PS4) or B (Xbox One) to deliver a blow against your opponent! Sometimes, though, a hasty escape is required. A level 30 couerl shows up and starts ravaging your party, for example. Ignis is down, Prompto is grasping for air, and only Gladio is engaging the monster. You only need to run away from the battle zone. You’ll see this zone on your minimap as a red circle. The battle ends once you leave the circle, reviving any fallen men along with it. Of course, your best bet when it comes to defending yourself is to take out your opponent as quickly as possible. Hitting the circle button (PS4) or B button (Xbox One) as fast as you can to take out an enemy with combos. However, this could also be done by holding B, leading to an automatic hail of blows that climax with a powerful coup de grace. Different weapons can be used to attack in different directions when you hold circle / B while tilting the left analog stick. Multiple enemies surround you. You want to focus on killing them one at a time. Therefore, you will need to lock on to them and start hacking there. You can do this by holding R1 (PS4) or RB (Xbox One). If you want to change targets, you could use the right analog stick to move between targets. If you found yourself to stop a combo, there is a very small window of opportunity for you to perform a finisher. This is a powerful attack that can be done by releasing circle/B and pressing it again very quickly. Take note that Noctis steps backward to indicate that you could potentially unleash a finishing move on your opponent. As you are fighting, you may find that some attacks can break enemy appendages. Take a look at the targeting reticle when you have it locked on to a certain enemy. You will notice that there are reticles around each distinct body part. You can target different body parts using the right joy stick. Are you looking for a different strategy? Are you fed up of that polearm, or tired of wielding that huge, unwieldy greatsword? Do you want to start raining down bullets on your enemies from the distance with a six-gun? Then you should best be familiar with switching weapons. To switch weapons, simply use the directional buttons in battle, and you will rapidly change selections. Take note that this is strategic, since many enemies are susceptible to various kinds of weapons. As you battle, you begin to see that some normal attacks dealt more damage than others. This is called a critical hit. Make sure you take advantage of weapon buffs so that the probability of you landing a critical hit would increase. Let’s say that you’re facing a huge bloodhorn. You roll-dodge so that Noctis avoids its horns and faces its hindlegs. Noctis performs a contextual attack when you stand behind it. These are called blind sides. You can perform a huge barrage of normal attacks from behind. Flying enemies swarm you. You warp-strike at one of them and start hacking at one of them with a combo, remaining in the air until you finish attacking it. These are called Aerial Combos. In Final Fantasy XV, your companions also can help you with link attacks. These attacks are performed when Noctis is near one of his companions as they start attacking the enemy. Sometimes, you need to find out what your opponent’s weaknesses are. They might be weak to fire, ice; to spears and guns, and the like. With this in mind, you will need to use libra. Both Noctis and Ignis use libra. During wait mode, you ought to look onto the target. This process might take some time. You will be able to see both a circular gauge to see if the process has finished. When a monster has available libra information, there is a scroll icon that appears next to the its name. If you want Ignis to discern enemy stats, you will need to first get Ignis’ “Analyze” ability in the Teamwork Ascension tree. If Ignis is successful, you’ll be able to quickly see the opponent’s statistics. Final Fantasy XV won’t be a Final Fantasy game without magic spells. However, unlike the learned spells in the previous installments, spells are items. In fact, they are elemental energy collected from deposits that are littered around the world of Eos. With a magic flask, you could absorb this energy. Crafting a spell can be done by going to the main menu and going to the Elemancy menu. Take note that the number of magic flasks you own determine the number of spells you can own. Take note also that flasks remain in your inventory after their payload is spent. Equip your spells in the gear menu as a primary arm (or secondary for your allies). This will take the place of a weapon, and can be accessed by using the directional buttons. To cast a spell, hold down your attack button. A reticule will appear. You can now aim with your left analog stick. Realising the stick unleashes the spell. These spells ought to be used strategically. It’s laborious to even craft them, much less use them in battle. However, the devastating effects of spells are certain, and once you learn to use them to take out a massive portion of your enemy’s health, the better. Apart from standard spells, a Final Fantasy game always has special abilities. They call some special abilities as quickenings, limit breaks or something similar throughout the franchise. However, in Final Fantasy XV, special abilities are called Armigers. Take a look at your Primary Arms display. That’s on the bottom-left corner of your screen. This will fill gradually as you attack your opponents and defend yourself with success. Once it’s full, you can unleash this by pressing L1 + R1 or LB + RB at the same time. This is obtained along with the Swords of the Wanderer during Chapter 03. Of course, Noctis isn’t the only fighter in the party with special techniques. Your party members also know how to fight and deal heavy damage, and one command from you using the L1 button and pressing directional buttons is enough to unleash their attacks. Note that techniques have their own gauge, a green one to the left of your screen. The technique will consume a segment of the gauge depending on the technique assigned to each party member. In the middle of battle, you could press R2 to bring up the Items Menu. This is useful if you need potions or phoenix downs to keep your party going as long as they could. Do you miss the old turn-based feel of the old Final Fantasy games? Do you want a calmer, less stressful battle system? Do you want to observe your enemies, plan out your strategies, and plan ahead for each battle? Then you ought to go to your main menu, select options, and then switch the Combat entry from Active to Wait. Wait mode affects the flow of time as you fight enemies throughout the world of Eos. When you are standing still and still deciding to make commands, time stands still. However, time flows when you are attacking or directing your companions to attack. Do take note that Wait Mode can only be used for a limited amount of time. You automatically revert to Active Mode when the wait timer at the bottom of the screen reaches zero. Do note that libra can only be used in wait mode. The world of Eos is a very dangerous place. You could get trampled by huge beasts or be ravaged by daemons. That is why you need to take care of your health points (HP) in the game. Each member has a maximum HP value as well as a current HP value. Normal enemies will only subtract from the current HP value, and not the maximum HP limit. However, Daemons deal damage that reduces both. Be careful. You will have to rest at a camp or lodging or use rare consumables to bring back your maximum health points. If you die, it’s game over unless you quickly use a Phoenix Down or another item. On the battlefield, damage is dealt either physically or magically. The strength attribute is considered when physical damage is dealt, while the magical attribute is considered when spells are used in the battlefield. Take note that many enemies are either resistant or weak to certain things. You’ll see that the damage values on your screen will vary in color. If the color is white, you are dealing standard damage to your opponent, while damage values in orange stand for increased damage. Purple, however, denotes damage resisted by the enemy. Take note of these combat basics as you traverse the world of Eos. Happy hunting! Source: Final Fantasy XV: The Complete Official Guide. I would also mention the “warp-kill” mentioned at the beginning is not a combat basic. It is only available as a mechanic in one area of one of the chapters and isn’t available again after that.